I'm a firm believer that, in this course of life we have, it's a mistake not to do what you love to do. I can't stress that enough. I think that when you don't pursue what you want, you deprive yourself of the happiness you deserve and that you're limiting yourself from experiencing all the amazing opportunities you should be going after. Sometimes you have to give up something in order to purse something. That's okey because you'll never know where life will take you. You just need to have the courage to follow your heart and at the same time be responsible enough to deal with whatever situation you are in. You'll also need to be ready to take on the challenges that comes along with it. Because let's face it, it will not always be rainbows and butterflies. But if you think it will make you happy and that it will fulfill what you've always dreamed of, then please do. You only have one life to live, why waste it? Gone are the days where pencil skirts are deems strict and boring. Yes, we all know how corporate this cut is but with Anthrologie's new pencil skirt prints, you surely wouldn't want to go back to the classic black. During my two week long vacation in Manila, I manage to buy a few beauty stuff that I have been wanting to splurge on for quite sometime. Even though Manila is not exactly the cheapest place to buy these stuff, I've convince myself that since I'm already there then might as well get my hands on them. I'm totally a convert now. After using L'Oreals Gentle Eyes and Lips makeup remover for almost 4 years, I've decided that it's time to ditched the cotton and oils and switched to a cleansing oil instead. I find it irritating to keep on rubbing cotton on my eyes to remove my eyeliner and especially my mascara. But this cleansing oil is so easy to use and very gentle on the skin. 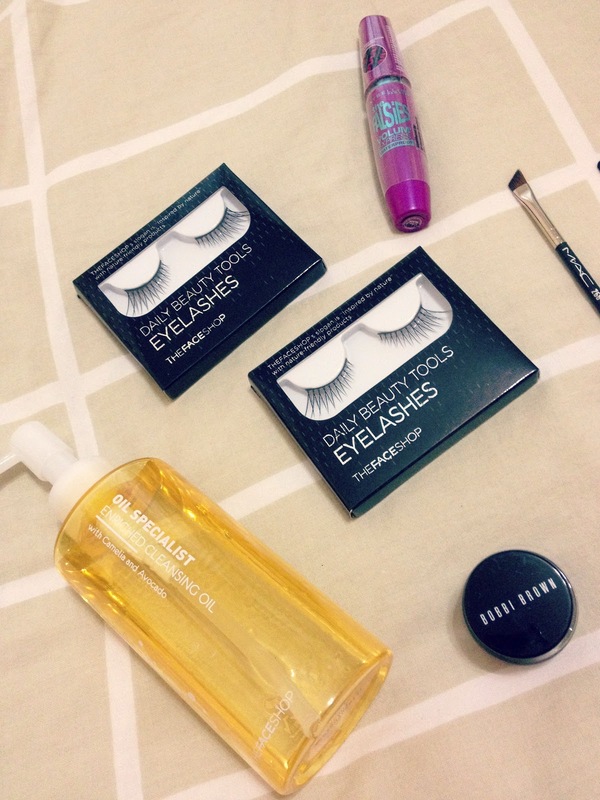 I've tried lots of eyelash brands from the highs to the lows and I always go back to this. There is something about this lashes that just makes my eyes pop so prettily and that I could wear it without hitting my glasses. I've heard so many good stuff about this and I've finally decided to get my hands on it. It's the first time I used gel liner because I got tired of using pencils and liquids, but so far I'm loving it. It doesn't smudge at all and it is very long wearing. This is probably my 3rd tube and it's my absolute favorite drugstore mascara. It just lengthens my lashes without clumping and perfect for the lower lashes too. 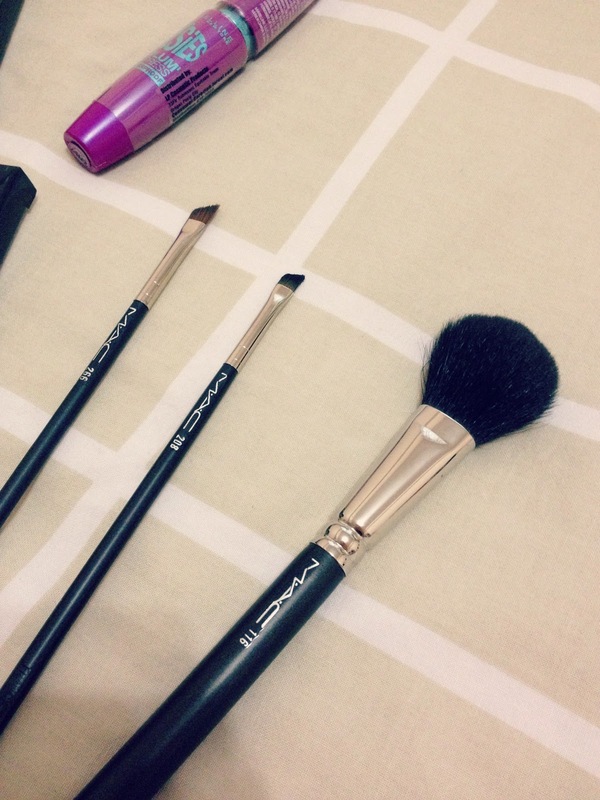 I'm starting to collect MAC brushes and I'm happy to finally get their classic blush brush. The size and shape is just perfect to put the right amount of blush onto your cheeks without looking like a clown. This maybe a brow brush but I find it perfect to use as an eyeliner brush. It's small enough to put just the right amount of product onto your eyes and the angled corner makes it very easy to do a winged cat eye look. When I left my small angled brush that I use for my brows, I felt so paralyzed. I couldn't find any cheap alternative to it so I decided to go with this. It's very easy to do my brows using this because it's big enough to fill in the spaces without constantly going over it. I didn't thought I already had the small E266 already from 2011 holiday collection and I only found out when I got back here. But I least I had the big one now right? Last Thursday, I got the most exciting news. I got my job promotion! I'm now an Assistant Account Manager. I'm a sucker for fancy title. I don't know why but maybe because the way it's linked to you name is somehow an indication of where you are in your career. And I'm proud to say that I am moving up the corporate ladder and that all my hard work has finally paid of. Those days of running around meetings after meetings, dealing with problems after problems were all worth it. I'm now more inspired to do a better job, to do what is expected of me and more. After almost 4 years in the industry, I have finally accepted that in this unglamorous world of advertising, unlike most people think, takes a lot of hard work, passion and dedication in order to succeed. It's not enough that you just do it but more so to be willing to take the extra step to do what is necessary. It's not all fun but when you're doing what you love then success would just fall naturally onto your lap, especially when you least expected it. Corals and blues are definitely hitting me up this weekend and I kind of like the combination of both. Whether it be in your living room, office space or in your wardrobe, a pop of colour always do wonders. I like the coral accent table and the high waisted pants a lot. The former has this oriental feel that brings out a lot of character in an ever so plain space while the latter has such a unique print that can easily jazz up any outfit. With all the sales going on at every corner, I can't help but get a few stuff for myself. I manage to get a couple of clothes but these two are my absolute favorite. Though the shoes may not sale but it's totally worth it. It's similar to this pair of Jimmy Choos that is currently on sale. As for the jacket, I got that for half off. It's such a steal. And while I doubt if you can still find it in stores, you can opt to get this Vanessa Bruno floral jacket instead. It has a similar look but definitely cheaper. After a much needed vacation, I'm finally back. I was away for about two weeks and had an amazing time going around the city and trying new places to eat. Nothing much have changed since the last time I visited but nonetheless, it felt good to be back home and be able spend some quality time with my friends and family. During my vacation, me and my friends went for a long getaway in Boracay, a beach down south of Philippines. It was my first time there and the place was absolutely gorgeous. The painstaking ride of going there was well worth it. The foods are amazing and the hotel we stayed in was just enough for me to even consider a staycation; big room, breakfast in bed and a full on floor to ceiling window. I couldn't ask for anything better. But what's all the fun without soaking up the sun, strolling by the beach, getting a full body massage and drinking lots of mojito. I must say, I had the most relaxing time ever. Now as I sip my coffee writing this and chill house music playing at the background, I'm thinking where will my next getaway be; Paris, New York or Milan perhaps? There's so many places to visit and while my mind is wondering around where to head next, you may want to start your year with a beach getaway as well along with my essentials here. Red is probably my favorite nail polish color to wear on my nails. Whether it's a warmer or cooler tone, I always find myself gravitating towards it more than the other colors I have in my collection. It's growing by the number but I have a good amount of reds to choose from whatever my mood is. For the holidays I wore Essie Fifth Avenue, my favorite red by far. It's more on the orangey side but I loved it. I loved it so much I painted my nails twice using this same color. This year my theme is to Be The Best Version of Myself. I want to just embrace life, do more of what I love, meet more people and look amazing while I'm at it. It's going to be my year and I won't allow anything to stop me from achieving it, even myself. It's has always been on my list and this year it would be great to have that fulfilled. I remember when I went to London, it wasn't even planned I just abruptly booked a ticket as soon as I got my visa. I was really carefree and this time I might just do the same. I love fashion and beauty. So this year I want to make the effort to continuously read and learn more about it not just when I feel like it. I didn't get to do it that much last year but this time, I'm willing to just get myself out there and see what life has in store for me. There's no point sitting around at home on a Friday night when you can go out and have fun and meet new people. This has always been on my list for years but this time I want to challenge myself to actually do it. With so much activities I have in mind for this year, getting organized is a must. This year I want to invest more on items that would last me for years. I tend to treasure pieces in my closet is of good quality and higher value. So instead of buying a lot of those that wouldn't last very long, might as well invest in a good one.